People looking at the raffle items at the Artisans at the Mall event. 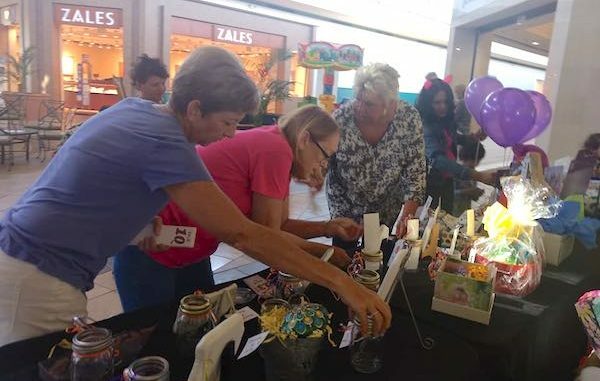 VERO BEACH – The Indian River Mall in Vero Beach had more activity than it’s seen in years on Saturday, April 7th, thanks to H.A.L.O’s Artisans at the Mall event. “Artisans at the Mall” is a monthly craft show/animal adoption event at the mall featuring local vendors, raffles, and much more. From the moment you entered the common area leading from the H.A.L.O. Adoption Center (tucked between Victoria’s Secret & Sears), the energy and atmosphere was celebratory! With tables full of beautiful raffle items (over 50+ to choose from), and volunteers with smiling faces ready to assist you to purchase that “one” winning raffle ticket, it was evident the Artisans were back! A total of 37 vendors participated at the event, each with something new and handcrafted to offer. Vendors wrapped around the fountain all the way through the corridor leading to the Food Court and extended beyond to the next corridor. There was something for everyone. 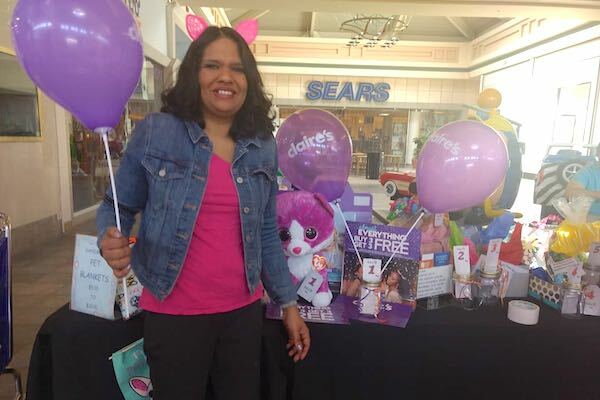 Pictured is Candice Tiwari, the store manager of Claire’s. Clearly, this is a family-oriented event. Kids were getting their face painted, being amused by a balloon animal artist, taking selfies with the animal cutout stand, and enjoying the craft table set up by H.A.L.O. volunteers. Parents seemed very pleased with all the interaction. A vendor with handcrafted wind chimes added a little music by demonstrating the sound they would make in the wind. Tasty and tempting fudge samples were handed out by another vendor. Painting demonstrations were provided by an artist working on her latest creation. There was something new to look at with every step! The highlight of the event happened around 4 p.m. If you were in the Mall during that time, you would have seen a large gathering of people around the fountain area, getting as close to H.A.L.O.’S now coveted “Raffle Donation Station” as possible. The majority of the raffle donations were generously created by the “Indian River Rocks” rock painting group. The true meaning of this group is “KINDNESS” which was evident with the vast array of donated items. 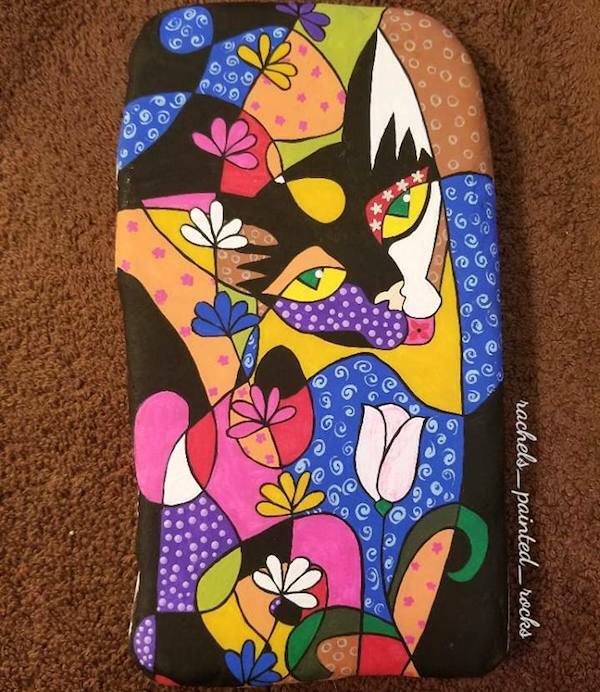 Painted rock by Rachel Shoaf of Indian River Rocks. With so many people lined up to hear if they had won a raffle item, the announcement of each item had to be done with the use of a bullhorn. An unusual occurrence at the Indian River Mall. The success of “Artisans at the Mall” helps to raise funds to support the efforts of H.A.L.O. NO KILL Rescue and Adoption Center. H.A.L.O. is Indian River County’s ONLY no-kill, non-profit animal rescue and adoption center. It is with the support of events like this and community participation that H.A.L.O. can continue with its efforts to save the lives of hundreds of animals each year. The next Artisans at the Mall is scheduled for Saturday, May 5th at 11 a.m. At 4 p.m., the sound of the bullhorn will announce raffle winners. For more information on how to become a Vendor or for details about this monthly event (held on the first Saturday of each month until further notice), please contact H.A.L.O. NO KILL Rescue Adoption Center at the Indian River Mall at 772-778- 8798 or email [email protected]. The Artisans, animals to adopt and the raffle prizes will be waiting to see you there.